AUSTRALIA: A wind project in northwest Tasmania will be the guinea pig in a programme examining how wind projects can provide frequency control services (FCAS). The 168MW Musselroe project has been in operation since 2013. It comprises 56 Vestas V90 3MW turbines, and provides roughly 5% of Tasmania's electrical supply. The region of Tasmania is known for its constant winds, known locally as the "Roaring Forties", in reference to its latitude in the southern hemisphere. Now, the Australian Renewable Energy Agency (Arena) is partly funding, with the project owner, a A$1 million project to investigate if the project can provide grid stability services in an financially viable way. To keep the system stable, generators must be able to increase or decrease load quickly to keep the grid frequency stable. This role has traditionally been filled by conventional power generators. 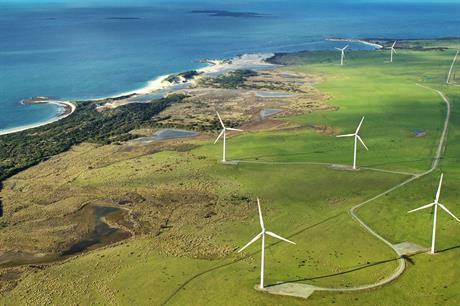 It is the second time a wind project in Australia has trialled frequency response. The Neoen 100MW Hornsdale 2 project in South Australia was part of a programme last year to provide the service, supported by the Australian Energy Market Operator (AEMO). "The Musselroe project will also trial this approach, seeking to discover whether the provision of FCAS services is technically possible, but will add an additional layer of complexity, examining the potential commercial and economic value available to a wind farm from participating in the FCAS market," Arena explained. The Hornsdale 2 project is also home to a battery storage system, provided by Tesla. "Wind power is playing a big part in Australia's transition to renewable energy and we want to explore how wind can provide essential grid stability services," said Arena CEO Ivor Frischnecht. "Musselroe Wind Farm will be able to answer for us the key question that so far hasn't been answered; does it make economic and commercial sense for a wind farm to provide FCAS and participate in the FCAS markets?" added Frischknecht. Wind projects across the globe are increasingly playing a role in grid balancing or frequency response. This adds to projects' revenue streams, making it a more attractive opportunity for investors, as well as demonstrating the potential of low-carbon energy systems. In Spain in 2016, developer Acciona Energia demonstrated how wind projects could provide reserve power, to make up a shortfall left by thermal generators. By purposely pitching turbine blades out of their usual optimal angle with the wind, the company kept power output below full potential output. This gave the national grid operator Red Electrica de Espana (REE) a reserve of power to call upon when needed. Elsewhere, in the UK, offshore wind developer Ørsted (formerly Dong Energy) carried out tests on the 90MW Burbo Bank project to demonstrate the site's ability to provide frequency response.